A photograph of a crying child has been announced as the overall winner of the World Press Photo of the Year awards. The winning photographer John Moore, who works for the Getty photo agency, received his award from Prince Constantijn of The Netherlands at a ceremony in Amsterdam last night. 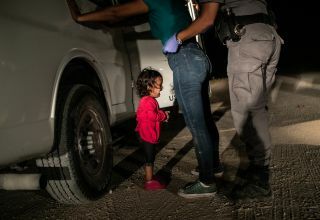 The American pro's winning picture graphically depicts the moment that Honduran toddler her mother, Sandra Sanchez, are taken into custody by US border officials in McAllen, Texas, USA. Immigrant families had rafted across the Rio Grande from Mexico and were then detained by US authorities. Sandra Sanchez said that she and her daughter had been traveling for a month through Central America and Mexico before reaching the US to seek asylum. The Trump Administration had announced a ‘zero tolerance’ policy at the border under which immigrants caught entering the US could be criminally prosecuted. As a result, many apprehended parents were separated from their children, often sent to different detention facilities. After this picture was published worldwide, US Customs and Border Protection confirmed that Yanela and her mother had not been among the thousands who had been separated by US officials. Nevertheless, public outcry over the controversial practice resulted in President Donald Trump reversing the policy on 20 June. The photograph was taken last June with a Canon EOS 1DX Mark II with a 35mm lens. The exposure was 1/100sec at f/3.5 at ISO2500. John Moore is a senior staff photographer and special correspondent for Getty Images. He has photographed in 65 countries on six continents and was posted internationally for 17 years to Nicaragua, India, South Africa, Mexico, Egypt and Pakistan. Since returning to the US in 2008 he has since focused on immigration and border issues. Moore has won several top awards throughout his career, including the 2005 Pulitzer Prize for Breaking News Photography. The other nominees and winners of this year's awards can be found on the World Press Photo website.